Bukkyo Dendo Kyokai (BDK) or the Society for the Promotion of Buddhism recently moved its American headquarters from Berkeley to Moraga. The suburb will not house the United Nations, as it had once been considered, but it could become a hub of Japanese spirituality and culture. BDK Center's manager, Brian Kensho Nagata, and his team have started meeting with local organizations, cities and Saint Mary's College to offer or support cultural and spiritual awareness events and training. The first two classes will be offered at the Moraga Community Center: "Mindfulness Meditation" and "History of Buddhism in Japan." More classes will be offered in the fall. BDK was founded by Ex. Rev. Dr. Yehan Numata in 1965. Numata was a Japanese-born man who came to the U.S. in the early 1900s to study. He was one of the first Japanese students admitted at Cal, where he earned his bachelor's and master's degrees. At the time, he could not help noticing anti-Japanese sentiment and believed that ignorance of each other's cultures was at the root of the problem. Coming from a Buddhist family, he believed that educating Westerners about the teaching of the Buddha would change their perspective, and be a great step toward global peace. Nagata says that in order to fund such a mission, Numata decided he had to make money. He founded Japan's first precision measuring company in 1934, now known as Mitutoyo Corporation, which is one of the world's largest manufacturers of precision measuring instruments today. With the benefits derived from Mitutoyo, Numata funded the Bukkyo Dendo Kyokai. "Its mission is to support Buddhist teaching which is based on the spirit of wisdom and compassion, to assist in bringing about lasting peace and happiness for all of humanity," says Nagata. It happens that the father and grandfather of the Zen priest who will teach the classes in Moraga, Rev. Dr. Masaki Matsubara, were part of Numata's enterprise as Buddhist priests themselves. "They walked with him," said the priest. "Now I walk with them." The way BDK operates is multi-faceted. The nonprofit is well known for the publication and distribution of the book "The Teaching of Buddha" and 8 million copies have been given by BDK to be placed in hotel rooms in 50 different countries. BDK also funds the Numata Program in Buddhist Studies, which is now affiliated with 15 universities in North America and Europe. During his lifetime, Shakyamuni Buddha gave hundreds of teachings that provided the basis for today's different schools and sects of Buddhism. In 1982, the BDK English Tripitaka Project was established in Berkeley to publish English translations of the Buddhist scriptures. That work now continues in Moraga. "We see an emergence of many volumes on Buddhist thought, philosophy and specific teachings but most are usually interpretations developed by the specific followings or sects," explains Nagata. "The work undertaken by BDK is to translate from ancient Chinese into English the original 7,000 scriptures of the Buddha, so we can go back to the source of his wisdom." In the Moraga office, the first translated volumes are lined up along the wall, but it is only the beginning. "We estimate that the work will take hundreds of years," says Nagata with a smile of infinite patience. As the nonprofit moved to Moraga, management immediately sought local partnerships with the town and the college. The building on School Street is large enough to accommodate classes. 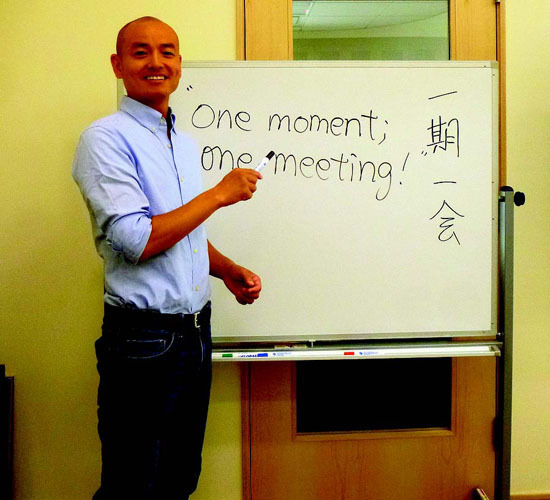 Matsubara, who will teach the first classes in Moraga and during the January term at Saint Mary's, has studied Buddhism both as a priest and as a scholar. He has a doctorate in Asian religions from Cornell University, has taught in higher institutions such as UC Berkeley, Cornell and Stanford, and he is the head priest of Butsumoji Zen Temple in Japan. "Having studied both perspectives allows me to see the teaching of the Buddha through two different lenses - as a priest studying the texts as sacred words, and as a scholar studying them in a more contextual and historical perspective," he says. His classes, Mindfulness Meditation and History of Buddhism in Japan, are secular sessions open to all, with no intention of converting anyone, but to enrich, improve consciousness and release stress. Since BDK has been active in the East Bay for many years, staff knows many local Japanese art experts in flower arrangement, embroidery, or dancing. Activities will start at the center with Lynda Fu, certified by the Japanese Embroidery Center of America, who will introduce the basics of Japanese embroidery. The class will start at the end of October, right after the exhibition "Painting With Threads," featuring works of Hawaiian and Californian artists. "We want to understand what the Lamorinda community would be interested in," said Numata. "Our desire is to contribute to the society where we are now located." For more information about BDK, visit www.bdkamerica.org. To register for classes, visit http://www.moraga.ca.us/dept/park-rec/about. Classes start on Sept. 9, but new students can still join during the second week. 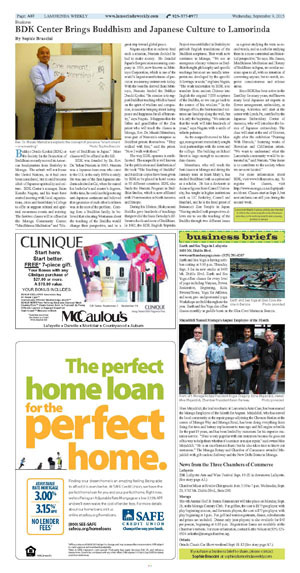 Lamorinda Weekly business articles are intended to inform the community about local business activities, not to endorse a particular company, product or service.